Department of Archaeology, University of York, UK. This special volume of Internet Archaeology collects the leading voices of blogging in archaeology to provide a critical examination of informal, online self-publication. This collection of articles is one result of over a decade of digital communication; the confluence of a conversation that grew from a few lonely voices to a tumultuous cacophony. Even so, blogging has had very little scrutiny in wider archaeological publication (but see Caraher 2008; Kansa and Deblauwe 2011). The first movement toward this volume was the Blogging Archaeology session at the 2011 Society for American Archaeology meetings, accompanied by a "Blog Carnival," a groundbreaking effort to foment reflexive discussion prior to the conference. Several participants of this original session and blog carnival have contributed to this volume; these articles are intermingled with perspectives from contributors who have started blogging in the intervening time, and with peer review comments from archaeologists who have blogged for a long time, and from those who do not blog at all. The topics covered within these ten articles range from network analyses to video blogging, from pedagogical approaches to explicitly political interventions, and from artistic expression to the telegraph-modality of blogging contained in 140 characters or less. The diversity of these topics demonstrate the remarkable range of expression available to the authors of the digital short form; this online community of practice has previously been described as "noisy, multilingual and multi-authored, and sadly often unarchivable or incompatible with traditional means of archaeological publication, there is so much colour and life in our digital village that it defies boundaries and descriptions" (Morgan and Eve 2012, 522). In this volume, we have attempted to capture and present this colourful digital noise through the more traditional form of peer reviewed journal publication. To meaningfully circumscribe archaeological blogging, we present this introduction as a form of paradata—details about the decisions that went into forming this volume. These paradata include a brief background of blogging in archaeology, the context and connectivity of the articles in this volume, and the contingencies of the experimental publication employed by Internet Archaeology in including open peer review and the addition of a comments section that will be archived with the original articles. Finally, we invite you to join this conversation, through commenting on these articles, engaging with #CritBlogArch on Twitter, or starting your own blog. Archaeologists have had a long engagement with the internet, occupying the first public newsgroups on usenet (Bathurst 2000), learning HTML to build basic websites and experimenting with hypertext (McDavid 2002; 2004; Joyce and Tringham 2007), editing archaeology entries on Wikipedia, and engaging with social networking sites to promote archaeological interests (Perry and Beale 2015). There is a growing emphasis on digital literacy at universities with archaeology degree programs and a marked increase in conference papers, dissertations, and journal articles addressing various aspects of digital media and archaeology. Self-publishing through social media and blogging has significantly diversified online perspectives regarding archaeology. To provide the context for archaeological expression online, a summary of the forms of archaeological blogging follows. Since the first instances of blogging 30 years ago (Blood 2000), the short form of digital self-publication has split, metamorphosed and adapted to wildly different uses. Blogging, writing short entries within the framework of a simple online publishing scheme, is a simplified descendent of the personal web page that requires no knowledge of HTML or domain registration (Lister et al. 2009, 268). While the form originated in text and hypertext, there is an incredible diversity of blog form and subject matter. Though still incunabular and unstable as a creative genre, blogging remains a means to instantly self-publish content—perhaps this being the defining characteristic of a rapidly fracturing format. Some blogs incorporate photographs or graphics as a means to illustrate concepts contained within the written body of the work, though some have eschewed words entirely, containing only visuals as a defining trait (Ifantidis 2015). Currently, the main text-based platforms are Wordpress, Tumblr, and Blogspot, all of which have eclipsed the once popular LiveJournal. Within these word-based platforms lies the ability to embed links and multimedia, augmenting and illustrating the prose. Multimedia-based websites such as Flickr and Instagram are primarily driven by images. Originally conceived as a personal image archive, users of Flickr see it as "a social site, a place for sharing images" (Van House 2007, 2719). Many users of Flickr see their uploads as a form of self-expression contributing to a narrative, similar to text-based blogging. Recently, Instagram has eclipsed Flickr, offering instant lomographic/retro filters for photographs taken on smart phones. While many of the photographers using Flickr have DSLRs and therefore take the time to digitally alter the images using software such as Photoshop, Instagram allows instantaneous, in-phone editing. Another example of multimedia blogging is the vlog or video blogs that focus entirely on the video performance of the blog author, and these can be either integrated into a blog format with other entries that are textually based, or stand alone as hosted on Youtube (Tong et al. 2015). A variation on the short form can be found in micro-blogging on sharing platforms such as Tumblr, Pinterest, Twitter, and Facebook as well as a myriad of other websites and phone applications. Tumblr bridges the amorphous divide between text and photo blogs in microblogging form. While longer text-based writing is certainly present, Tumblr specialises in gathering and remixing digital ephemera. Similar to Instagram, contributions are intermixed with those of friends or contacts, creating a larger collective narrative. Dissimilar to Instagram, much of the content on Tumblr are found objects: images, text, videos and music that are not created by the user collecting the digital objects. Users can "reblog" other content, or repost content created or found by other users with no threats of copyright infringement or ownership. Reblogging posts is flattering to the original user, and reblogging also allows the person who reblogs the content to further comment on the content. Users can also "heart" content, which shows approval, but does not redistribute the original content. This amounts to a constant, manicured stream of digital content determined by the user's contacts and the user herself, who curates different content providing contacts. Pinterest operates similarly, though with a different layout, curation style and audience. A more ubiquitous and stripped down version of the short form, or micro-blogging, is Twitter (Richardson 2014; 2015). Seen progressively as a social, commercial, academic, then political venue, Twitter relies on 140 word updates, but allows linking to images and to other websites and "re-tweeting" of content. Conversations, comments and themes are organized by hashtag, which can be shared and commented upon generally by any Twitter user. Within the archaeological community Twitter has been used as a quasi-outreach based platform, with both announcements regarding archaeological news and conferences, but also as a conversational tool between archaeologists interested in digital media. Finally, combining many traits of various publishing platforms, social networking sites such as Facebook and Google Plus combine micro-blogging and photo-blogs together into a "stream" wherein users can view their content alongside those of their contacts. While classic forms of blogging are still popular and can be integrated into these social networking sites, the amount of people using Facebook eclipses all other forms of online usage. As published by the Pew Internet Research Center 71% of online adult Americans used Facebook in 2014, and 52% of online American adults now use two or more social media sites (Duggan et al. 2015). Using a social networking platform, archaeologists can combine outreach efforts with personal online presence, while reaching a broad audience. William Caraher (2008) marks the beginning of archaeological blogging in the late 1990s, with the later "great expansion of archaeological blogs" beginning in 2002. In the decade since that time, archaeological blogs have come and gone, multiplied and diversified, many experimenting with a range of formats. Of the 41 (non-institutional) archaeology blogs Caraher mentions in his article, 51% are still active (Figure 1). 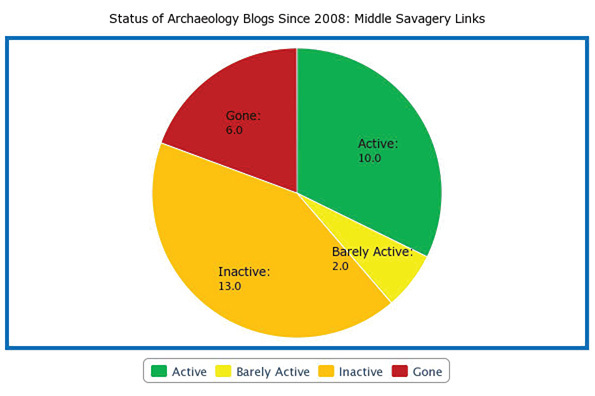 Caraher was oriented toward blogs exploring Classical and Mediterranean Archaeology; roughly at the same time in 2008, Middle Savagery linked to 31 Americanist blogs, 32% of which are still active (Figure 2). Law and Morgan (2014) documented a similar attrition of archaeology sites hosted on the now-defunct Geocities. In their submission to this volume, Caraher and Reinhard (2015) discuss the affordances of archaeological blogging at length, with the hindsight of seven years. In 2011, Colleen Morgan's blog, Middle Savagery, hosted a month-long blogging carnival that solicited contributions to weekly questions in anticipation of the Blogging Archaeology session at the Society for American Archaeology in Sacramento, California. During this blogging carnival, archaeologists contributed to discussions regarding best practices for digital archaeologists, not just in data formats and correct key word annotations, but the ethics and politics of being a public intellectual. The blogging carnival brought together archaeological bloggers of all kinds, with contributions from Twitter and commentary on Facebook. This session benefitted from a community (albeit perhaps one of weak ties discussed in Richardson 2015) cultivated during Morgan's long-term, diverse practice in online digital archaeology publication with blogs including the previously mentioned Middle Savagery, originally established on LiveJournal in 2004, as well as The Origins of Doha and Then Dig, the curation of a Flickr community titled Archaeology in Action, participation in Twitter including an early "live-tweeting" of an archaeological conference, the Theoretical Archaeology Group meetings at Stanford (Morgan 2009), and various other social networking initiatives. This involvement with online expression of archaeological ideas through various media is an extension of Morgan's (2012) research on tracing the object biographies of digital media as archaeological artifacts. This research situates blogs as an assemblage of digital artifacts that can to be understood as active members of a network of interpretive meaning (see also Hopkins 2013). This active membership in the construction of meaning must be emphasized as digital objects are often imagined to be ephemeral or insubstantial, existing somewhere "in the cloud." In this we move away from a text/narrative based analysis of blogging content to the understanding that bloggers are creating digital assemblages, simulacra of archaeological investigations, or, more generally, the lived experience and performance of being an archaeologist. Understood as such we can incorporate Lave and Wenger's (1991) situated learning as a primary principle of blogging. Many academic archaeologists use blogging for teaching (Brock and Goldstein 2015; Perry 2015), and as students are required to create digital assemblages that interpret archaeology, they are engaging in legitimate participation in online dialogue, becoming a member of a community of practice. 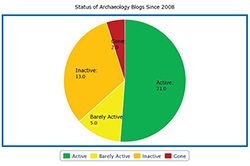 The archaeology blogging community has grown in this way, with participation from both the academic and professional sector to create a unique synthesis of a long-standing divide within archaeology. Legitimate participation is not necessarily tied to professional standing, but by contributions to the larger conversation. This volume, Critical Blogging in Archaeology, brings together reflections on these digital assemblages of legitimate participation in online archaeological dialogue in the form of peer-reviewed articles on current archaeological blogging. After more than a decade of experimental, informal publication, bringing this ongoing conversation into a more traditional format would seem counterintuitive, yet it is an important step toward making the impact of these alternate forms of publication visible. As Sara Perry (2015) points out, archaeologists have been experimenting with publication styles since early antiquarian literature. Her identification of blogging as a continuum of practice, and its relevance to all aspects of disciplinary theory and method, position blogging as one means to insert ourselves into "future world-making" (2015, section 2). Even as Perry defends her use of blogging to colleagues, Caraher and Reinhard (2015) note that blogging is a dynamic medium, and has changed radically in the seven years since Caraher wrote his first evaluation of archaeological blogging (2008). Caraher and Reinhard (2015) discuss the current affordances of blogging as a publication format and as a "community of practice," encompassing a network of shared expectations (2015). Many of their suggestions, such as open peer review and a comments section on articles have been incorporated into this volume. In their peer comments, Birch (2015) and Smith (2015) reflect on their experiences with publication and blogging. While Birch (2015) finds that blogging broadens access and makes archaeological research processes more transparent and inclusive and Smith (2015), while apparently disconnected from a blogging community, finds the visibility and public education aspects of blogging important for wider access to archaeological research. Richardson (2015) also queries the concept of communities in social media, with a focus on Twitter. The online performance of an "archaeological self" is limited within Twitter and the development of personal relationships on the platform is a longer process (Richardson 2015). Beale's (2015) comment suggests examining Facebook groups that have no formal or institutional ties and that the affordances of technology enables digital connections that are difficult to make in a physical community. Finally, Graham's (2015) network analysis of archaeological blogging suggests that instead of blogs becoming a meaningful middle ground between institutional research and an interested public, they have been sidelined for collective resources, mainly Wikipedia. Beyond their use within publication and community building, blogging has been used to identify political issues within archaeology and to advocate for change. Hardy (2015) discusses precarity in archaeological labour in Turkey, Italy, and the United Kingdom and the online mobilization of resistance. Online activism significantly augments other forms of protest, though it may leave the protestor more open to reprisals (Hardy 2015). Mullins (2015) highlights the importance of bloggers' voices for "the imagination of transformation, justice, and community in contemporary heritage labour" and calls for tenured academics to ally themselves with vulnerable colleagues. Lambert and Yates (2015) discuss the role of social media in the illicit trade in antiquities, and, echoing Hardy, find blogging about illegal activities leaves them personally open to attack. In his response Silberman (2015) acknowledge the vulnerability of early career researchers, but implores bloggers to have the courage not to self-censor, as "blogging is an ideal medium for a public intellectual in an era that needs much more public debate." The idea of blogging as personal expression and the reconfiguration of the professional self in an informal, yet broadly public venue shaped many of the articles in this volume. Meyers Emery and Killgrove (2015) and Lambert and Yates (2015) note that blogging has been instrumental to their academic development, identify gendered aspects in online communication and provide advice to others who would take up blogging. Yet Graham (2015) identifies the difficulties facing new bloggers in being recognized as signal rather than noise. Caraher and Reinhard (2015) also cite the "discoverability" problem and recommend micro-blogging to support the blog, or allying with a professional organization. Even so, Perry's students found blogging to be "liberating, creative craftwork" that was impactful in their professionalization and their understanding of archaeology as well as an intimate, personally resonant practice (2015). In her comment, Battle-Baptiste (2015) identifies herself as a historical archaeologist, a blogger, a woman of African descent living in the United States, a tenured professor of archaeology, and a wife and mother. In this, Battle-Baptiste reveals the personal commingled with the professional and the political, and the ways that finds expression within blogging. Perry's (2015) use of blogging as part of an engaged, creative pedagogy is also explored by Brock and Goldstein (2015) who brought social media to the Michigan State University (MSU) Campus Archaeology Program (CAP) in 2010-2011. Brock and Goldstein note that the objectives for CAP blogging were first pedagogical, then as public outreach. In contrast, Tong et al. (2015) explored video blogging or vlogging as public outreach for the Project Eliseg excavation. This vlog was used to overcome public outreach challenges such as the inaccessibility of the site to people with mobility issues, and a population that were resistant to archaeological interpretations of the Pillar of Eliseg. These vlogs join a host of other print and digital media engagements, yet the video format of the vlog was adopted to provide relevant and comprehensive information about the project to the interested public with a relatively low digital literacy requirement. These vlogs range between the expository and direct testimonial genres of archaeological filmmaking (Morgan 2014). In his response, Marwick (2015) identifies the two primary audiences for the Project Eliseg videos, that of interested members of the public with no knowledge of archaeology, and archaeologists, sometimes the same archaeologists conducting the excavations. This is a critical point for online public outreach in archaeology: these media are the narratives that we tell to the public about the past, and are at the same time the stories that we tell within the profession about ourselves. Each digital media assemblage lies within this duality, and this is evident in the photo essay by Fotis Ifantidis (2015), and the responses by Jesse Stephen (2015) and Steven Ashby (2015). Ifantidis' photo essay (2015) is an excellent example of the polyvalence of digital media; he includes a photo of a photo in a book, screenshots of his Flickr account, Instagram, and Facebook accounts, a scan, and displaced and chopped up digital photos that respond to his long-running photo-blog, Visualizing Neolithic, and accompanying Archaeographies photobook (Ifantidis 2013). This essay is arguably the most transgressive of the articles assembled in this volume, occupying a space between formal, peer-reviewed articles and blogging. When discussing the essay with the reviewers, I (Morgan) realized that peer review of a photo essay could be performed with photographs, and Stephen and Ashby have responded remarkably to this request. With the affordances of open peer review, more such responses, even media responses to text-based articles may be possible in the future. The decision to publish in Internet Archaeology was, as stated, a direct intervention to scrutinize blogging within the realm of formal, peer reviewed academic publishing. Yet this decision was also informed by the flexible, experimental nature of Internet Archaeology and the willingness of Judith Winters, the editor-in-chief to work with the authors and peer reviewers toward a new kind of publication in archaeology. Through a series of meetings, Colleen Morgan and Judith Winters discussed the possibilities of a dedicated issue for blogging, and discussed several features which may seem minor to the reader, but were integral to keeping the spirit of open, critical conversation throughout the range of collected articles. These features include: a comment section for each page, to be archived alongside the article; the inclusion of a Twitter feed with a dedicated hashtag #CritBlogArch to collect discussion about the issue, and open peer review for the articles. Archiving the social media discussion surrounding each of the articles, albeit within a set timeframe of six months (a decision taken for pragmatic reasons but further snapshots may be made if the conversation continues), and collecting the comments that each of the articles may attract, throws open the discussion around blogging in archaeology. While the articles are very carefully written and peer reviewed, each of these will perform as the nexus within a broader corpus; while this is certainly true within more traditional publications, this will be very transparently true and preserved alongside the articles to reveal this particular moment in digital archaeology. These articles are the beginning of a conversation, and the comments and tweets serve as supplementary peer review. Perhaps the most contentious aspect of this dedicated issue was the decision to implement open peer review. Open peer review seemed an obvious choice; after experimenting with it for several years on the peer reviewed archaeology blog Then Dig, Morgan found that open peer review encouraged civility, transparency of process and created meaningful connections and conversation between authors and reviewers. It is an iterative process, delivering the 'stamp of approval' and improvements to articles in a more transparent way. Additionally, in a relatively small cohort of blogging archaeologists, anonymous peer review would be unrealistic, and double-blind peer review impossible. It can be hard to find the most appropriate, available, and reliable reviewers at the best of times and this can slow down the publication process. So we were drawn to experimentation with open review for practical and efficiency reasons too (although the process is always only as fast as the slowest reviewer and delays are magnified when dealing with a themed issue). However leaving peer review to the community can allow the publication editor to focus on the other necessary accessibility, archival and technical issues. In practice, open peer review does not produce significant changes in the quality of peer review or the time interval for publication after submission, but it does cause reviewers to decline to review articles (van Rooyen et al. 1999). This latter effect can be seen in the paucity of reviewers for some of the articles. Although most reviewers responded favourably to our requests, some were reluctant to abandon the traditional system and were uncomfortable with committing to a public (perhaps critical) review. Furthermore, this was a first for many of the authors and the reviewers, who had significant reservations and mixed responses to the format. As is apparent from the articles, some authors chose to incorporate the suggestions of the reviewer, perhaps making the reviewer's comment seem oddly out of place. Some responded directly to the reviewer, either within the body of their own article, or as a stand-alone piece. We left this decision to the individual authors. The citable peer comments (each with their own DOI) and reader comments are collated in a single file so that threads and themes can be more easily followed and we welcome discussion of individual reactions to the open peer review process in the comments. Open peer review may not be suitable for all types of content, but where it is employed, it will force the editorial filter in the initial stages to be more exacting. I (Winters) am inclined to view it as an option for future content rather than a wholesale replacement of more traditional peer review (despite its imperfections). But in this case, working with authors who hone their writing craft more frequently than most through their blogs, it was an obvious choice. Blogging occupies an interesting, sometimes disruptive position in current and future archaeological dialogue. Attending to the materiality and affordances of this digital medium, understanding it as an assemblage, and encouraging participation in communities of practice will make blogging a critical tool in scholarly communication in archaeology. The articles in this volume provide a holistic perspective to a rapidly changing media landscape. The authors have been chosen both for their particular mastery of an aspect of blogging within archaeology and for their familiarity with a theory-based approach to communicating with online stakeholders. Finally, while we have chosen a format that will be familiar to those primarily involved with scholarly publishing, we hope to show the affordances of blogging, and push archaeological publishing toward accepting multimedia publications and opening conversation to a broader online public. With this dedicated issue, we provide a critical engagement with emerging forms of dissemination and frame future online discourse about archaeology. Colleen Morgan would like to thank Judith Winters for her extreme patience and dedication toward bringing this issue to life. Morgan would also like to thank all of the authors and the peer reviewers who were willing to experiment with this format, and all of those who have inspired her to keep blogging. This themed issue was made possible by the generous support of the Department of Archaeology, University of York along with some additional contributions via authors. Ifantidis, F. 2013 Archaeographies: Excavating Neolithic Dispilio, Oxford: Archaeopress. Lister, M., Dovey, J., Giddings, S., Grant, I. and Kelly, K. 2009 New media: A critical introduction, 2nd edition, Routledge. McDavid, C. 2004 'Towards a More Democratic Archaeology? The Internet and Public Archaeological Practice' in N. Merriman (ed) Public Archaeology, Routledge, London. 159-187. Morgan, C. 2009 'Twittering TAG (Theoretical Archaeology Group) Stanford 2009', Archaeolog, May 2009, http://web.stanford.edu/dept/archaeology/cgi-bin/archaeolog/?p=251 [Last accessed 20 May 2015]. Morgan, C. 2012 Emancipatory Digital Archaeology, PhD thesis, University of California, Berkeley. Richardson, L-J. 2014 Public Archaeology in a Digital Age, PhD Thesis: University College London.